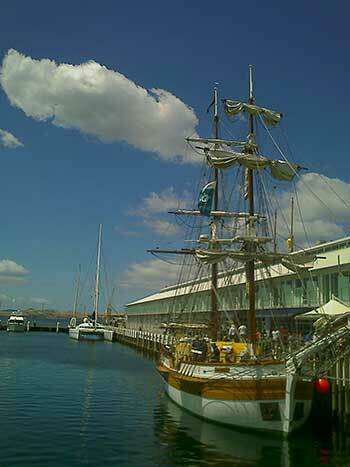 Party at Constitution Dock during the Sydney to Hobart race. 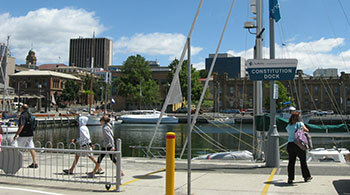 When I think of Constitution Dock, the first thing that comes to mind is the Sydney to Hobart race. Followed by Australians across the country, it's the national sporting event of the silly season. There's no denying the beauty of the views. Not just the sparkling waters of Sullivans Cove, or the far away landscapes of the suburbs on the east side of the Derwent River. Right up close I saw an amazing collection of vessels. And is there anything of interest at Elizabeth Street Pier? 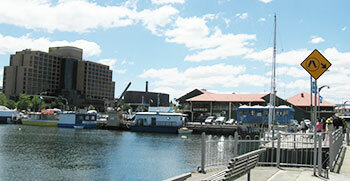 Looking across the dock toward the city, I could see the Tasmanian Museum and Art Gallery on the other side of Davey Street. I've enjoyed many wonderful visits there, learning about Tasmanian Aboriginal history, the Tasmanian Tiger and other interesting themes. I remember the terrific time I had at the "Islands to Ice" exhibition which was about Antarctica. Facing another direction I could see Mures, another unique Hobart establishment. It is the red-roofed building in the picture above. They have their own fishing boats for catching fish they process and sell. Their main business is in seafood but they also rent out private dining rooms on their Upper Deck. The large building on the left is the Hotel Grand Chancellor. As you might guess, all their rooms have views either overlooking the waterfront and the River Derwent or Mount Wellington and the city. That day, there wasn't a lot happening at Constitution Dock itself. The bridge was down as it usually is. What bridge? 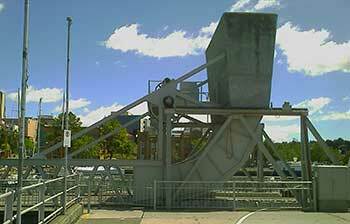 That's the bridge that allows pedestrians to continue walking along Franklin Wharf as they pass the dock. When it's up, boats can pass through. As we wandered away we caught sight of this delightful looking boat. It turned out to be one of Captain Fell's Historic Ferries. It looks pretty historic doesn't it?